Six months ago the sight of Mweelrea, monstrous and glowering in icy majesty beneath leaden skies, was both intimidating and exhilarating, the sight seared into my memory after we made the agonising choice ‘to leave it for another time’ as the light was fading and we turned towards the Lugmore Ridge. Here we were attempting Mweelrea again. There is no easy way to get to her, you have to be prepared to walk long and climb hard to attain the highest summit of Co. Mayo which makes this mountain somewhat special. We parked on the Dhulough Pass Road (L82845 69526 A) and walked across the narrow neck of land separating Doo Lough and Glencullin Lough, heading for the corrie below the jagged cliffs of Lugmore. The terrain was boggy, particularly as we approached the lip of the corrie. Keeping to the far left we avoided as much of the bog as possible to access the start of a series of grassy ledges at the back of the corrie (L81582 67622 B) that undulate upwards in a lung bursting climb to a col between Ben Bury and Ben Lugmore West Top. 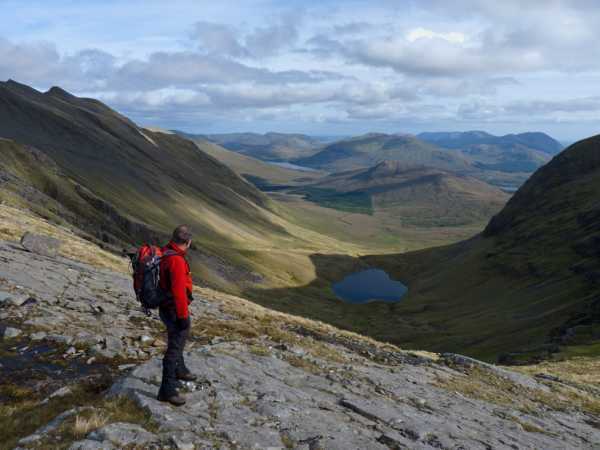 The terrain is fiendish, very steep in places and a stony path only becomes evident near the top, but this is compensated for by magnificent views of the loughs in the valley below and the serpentine coils of the Sruhauncullinmore River meandering amid the bog in the corrie. Close to the top the path narrows and weaves precariously along the side of the cliffs with a steep drop; it’s not difficult to see why some might find the exposure intimidating, but a rope is unnecessary. Reaching the col one is rewarded with scenery on an epic scale – the razor sharp edge of Lugmore Ridge sweeping down towards Lough Bellawaum and ahead, the enormous hulk of Mweelrea sitting imperiously above Killary Harbour and the Atlantic. The remainder of the climb to Mweelrea is easy after the ordeal of the corrie, passing over fairly benign terrain and by some interesting glacial erratics. At the summit, our eyes feasted on the beauty of small green fields flanked by yellow ribbons of sand and the endless Atlantic with myriad islands floating just offshore. The view extended as far north as Achill, the towering cliffs and cone of Croaghaun clearly visible and to the south, the edge of Roundstone Bog, the pools within glinting angrily like thousands of shards of glass. Inland, the Maumturks and the Twelve Bens huddled together like advancing armies.